Children come in all shapes and sizes and with many unique interests. Keeping a child active is a good way to instill a love for movement. Once kids lose interest in playgrounds, what’s the next thing you can do to help them with staying active and healthy? There are many options, such as recreational hiking, skateboarding, tennis, walking a pet, and organized sports. For example, if your child loves the outdoors, visiting a park with unpaved paths can be a great motivation to get everyone in the family moving. Is your kid an athlete, or does he or she enjoy competition? Help them focus on a sport that is fun, yet challenging. Pressuring children into a sport they don’t enjoy could potentially lead to them quitting and not wanting to be involved in other sports or competitive activities. Supporting your child through their exploration of activities can help foster a positive relationship with their competitive interests. Team sports aren’t an option for all kids, though, and that’s okay. Less traditional ways of being active can also increase health benefits for your child. Doing volunteer work for an animal shelter by being a dog walker can help your child while helping the shelter and their animals. This will get your child moving, and they won’t even realize they are exercising. Volunteering with an organization that cleans up trash around the community or helps build homes can also be ways to get a child interested in different types of activities that get them moving. 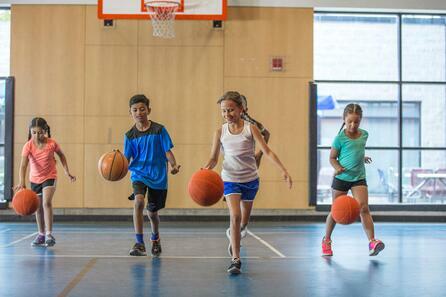 Just getting the opportunity to be active can motivate kids to get involved. If they are having fun, they will have greater interest in doing those sports, activities, or competitions on a regular basis. How do you get your kids moving in the winter months? Comment below and share with us!